Interested in the art of engineering but don’t have the tech background? Need to fulfill a science requirement but want something that still allows you to think through social issues? APSC 366 was designed for you. Join four Engineering faculty members from a range of disciplines in exploring engineering practice, technologies, and products, and their connections to social, legal, and environmental realms. Learn the answers to questions like: How can we modify carbon to reduce climate change? Why do cell phones explode? What happens if your hip replacement gets recalled? How much energy is in a litre of gasoline, and what does it mean for the range of your car? 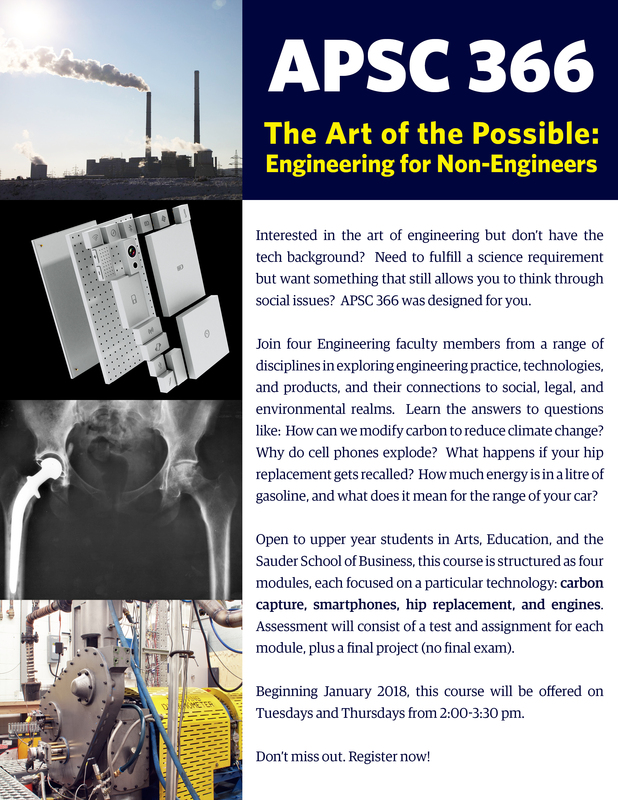 Open to upper year students in Arts, Education, and the Sauder School of Business, this course is structured as four modules, each focused on a particular technology: carbon capture, smartphones, hip replacement, and engines. Assessment will consist of a test and assignment for each module, plus a final project (no final exam). Beginning January 2018, this course will be offered on Tuesdays and Thursdays from 2:00-3:30 pm. Don’t miss out. Register now!